Samsung SmartCam HD Pro Review: How does it stack up? Samsung SmartCam HD Pro Review: Is it the New Genius of Security Cameras? There is no shortage of smart home devices that promise to help you keep a watchful eye on your home or work, even while you’re away. Smart cameras are a virtual guard that promise to track every move and stream, record, or download it for your review. One of the major players in the security camera sphere is the Samsung SmartCam HD Pro. But does this version outsmart the competition? Read our full Samsung SmartCam HD Pro review, then decide whether it earns your A+. 1.3 Samsung SmartCam HD Pro – Honor Roll Candidate? 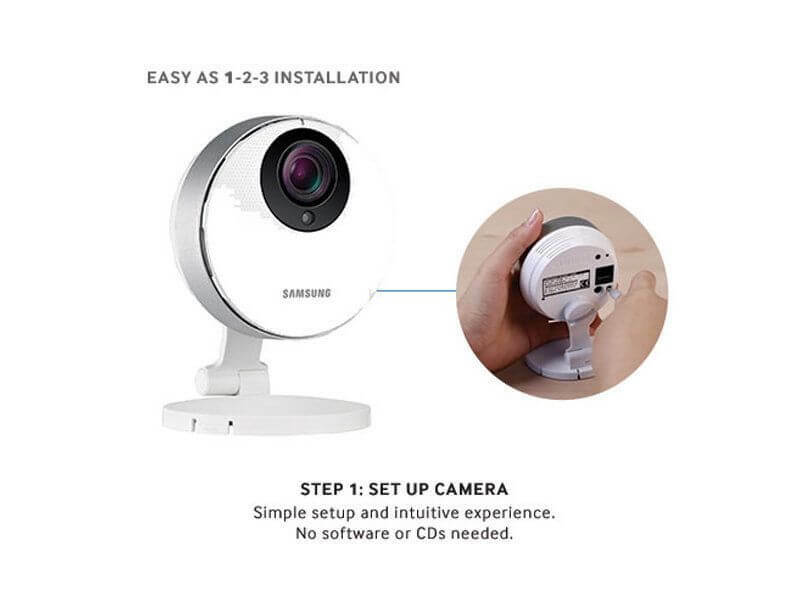 With the name of a technology giant behind it, you would expect any wireless security camera from the Samsung SmartCam family to be packed with powerful features worthy of the Samsung name. While there are several cameras under the SmartCam brand, the Pro version (model number SNH-P610BN) is the most promising in terms of features and user reviews. Wide Angle and HD Video – Events are captured in 1080p, which is becoming the new standard in home surveillance cameras. The camera boasts a 128 degree field of view, which earns top marks in terms of ultra wide-angle lenses (though if you feel the need to make that A into an A+, the Dropcam Pro has a 130 degree field of view). Unfortunately it doesn’t have pan/tilt capability, so you will want to make sure it’s placed just right when installing it. SLE & WDR – Those acronyms mean that low light or bright light is no problem for Samsung SmartCam HD Pro. SLE stands for Samsung Light Enhancer – which takes advantage of even the faintest amount of light in dark conditions to enhance visibility. WDR (or Wide Dynamic Range) is another feature that allows this SmartCam to adjust in backlit conditions that would otherwise cast shadows on the footage. Easy-to-Use WiFi Wizard – Download the Samsung app to your smartphone, follow the simple set-up instructions, and your Samsung SmartCam HD Pro will be ready for duty in a matter of minutes. 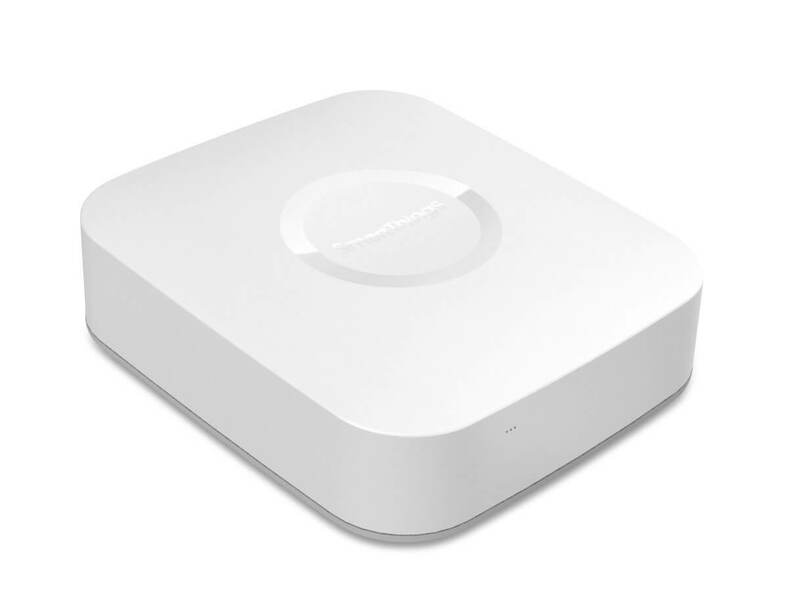 Connects to the SmartThings Hub – It only makes sense that one of Samsung’s top security cameras would integrate nicely with their signature SmartThings hub. The hub integrates all compatible smart home products, centralizing command and control of all your gear. This means you can automate your SmartCam with smart thermostats, sensors, door locks, and a variety of other smart home devices; schedule a “good morning” mode to have all of the devices automatically adjust to your early morning preferences. There are countless SmartThings ideas out there for automating your home. While the home security cameras of years past were just videotapes awaiting playback, today’s security cameras double as live recorders. The Samsung SmartCam HD Pro is no exception. Streaming and Storage – Activity can be viewed via browser or app access, or downloaded to an internal SD card (max memory of 64gb). The browser views can be buggy, and sometimes the feed requires a refresh to keep working, but it’s nice to have the option. Depending on your recording settings (night vision, WDR, etc. ), users report up to a week of surveillance can be stored on the 64gb card. If you run out of space, the SmartCam begins overwriting the oldest footage. Continuous Recording or Event Option – Monitor your home around the clock with the continuous record option. Alternatively, the SmartCam HD Pro is intelligent enough to only record events triggered by motion or sound. The best part? The camera can send recorded ‘events’ to the camera roll of up to 10 devices – giving you an instant shot of the latest action in the living room, your baby’s nursery, or even the office at work. Unfortunately, you can’t watch more than one camera simultaneously, but hopefully this will come with an app update later on. Real-Time Text Alerts – You likely aren’t able to sit and watch your security feed all day, but the Samsung SmartCam HD Pro has you covered. The device will send a text to your cell phone alerting you of motion or noise in the camera’s field of view. The alerts can come as email or push notifications, with a snapshot of the motion included. Samsung’s advanced motion and audio detection technology also promises to reduce false alarms, caused by mundane changes in the surroundings, like the trees in the background. Two-Way Talk Capability – Not all smart cameras have the brains to allow you to talk through the device, but as our Samsung SmartCam HD Pro review demonstrates, this camera prides itself on being a cut above. Use the two-way talk feature to say hello to your pet from the office at lunchtime or to remind your teenagers to get started on their homework after school! The ability to speak and listen through the SmartCam earns this device some extra credit. Note: The out-of- the-box speaker quality leaves a little be desired. To really be heard through the camera, you might need to purchase external speakers and install them via the device’s minijack. Samsung SmartCam HD Pro – Honor Roll Candidate? The SmartCam HD Pro delivers a wide range of functions combined with consumer-friendly options, without requiring you to commit to monthly cloud-based services. The accessibility of the feed and motion events (from an internet browser, the app, or your smartphone’s camera roll) makes it a versatile choice – especially if more than one person in your household wants to keep an eye on things. This particular security camera doesn’t accommodate larger SD cards, unlike some of the other Samsung SmartCam products. For instance, the SmartCam HD Plus holds up to a 128gb SD card. Also worth mentioning is the fact that the HD Plus captures events up to 32 feet away in the dark, instead of the 16 feet that the HD Pro is rated for. The other big difference is that the HD Plus has SmartCloud capability for an additional fee if you are a fan of cloud storage. Overall, the Samsung SmartCam HD Pro is a solid choice with a mid-range price point. Deciding if its features and benefits make it a smart choice for you really depends on how you plan to use your camera! 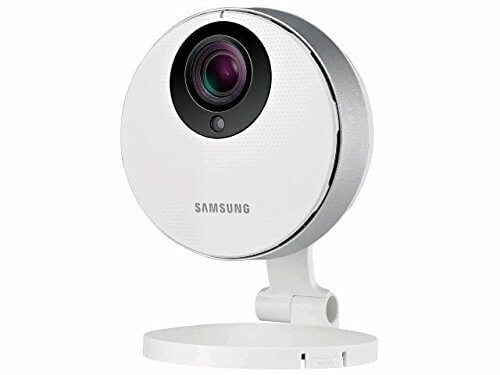 If you’re looking for some other standout options beyond our Samsung SmartCam HD Pro review, then be sure to take a look at our best wireless security camera article. 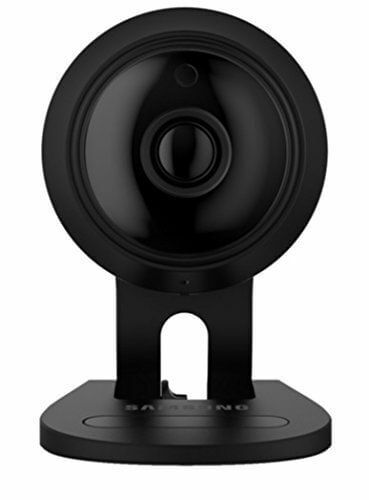 Which do you prefer – a wireless security camera that records to the cloud, streams to your device, or records to an SD card like the Samsung SmartCam? Let us know in the comments below!